It’s often said that the Gulf Coast is home to one of America’s best-kept secrets. With miles and miles of white sand and clear waters, it’s no wonder hundreds of thousands of people flock here each year to enjoy the unspoiled, pristine beaches. Most beach-goers are completely satisfied with lounging in a chair on the beach for hours, accompanied by a cooler of cold drinks and the sound of waves crashing on the shore. Certainly, there is nothing wrong with that. We all need a little R&R in our lives. But if you have the urge to ‘live a little’ while you’re here exploring, we’ve discovered the best seat in the house. And it’s on an Orange Beach Helicopters tour in Orange Beach, Alabama! Orange Beach Helicopters offers a variety of helicopter tours allowing you to choose the option that suits you and your family best. If you’re bringing the kiddos along, the ‘Beach Tour’ is the perfect flight for them or first-timers. We ventured on the most popular flight, the ‘Sea-Life’ tour. It’s designed particularly for those who want a bird’s-eye view of the numerous fish and animals swimming below. Or you can opt for a longer adventure on the ‘Around-the-Island’ tour and enjoy soaking in the views from the Perdido Key and Orange Beach area. Don’t forget your GoPro or camera (must have a strap) to capture a variety of sea creatures in their natural habitat. Not only does a helicopter flight make a phenomenal sightseeing excursion and check an item off your beach bucket list, it’s also perfect for many special occasions. The Orange Beach Helicopters crew specializes in making an anniversary, honeymoon or marriage proposal a divine experience. Their sunset tour with majestic views is the ideal option for special events – a flight you’ll never forget. “Everybody who embarks on a helicopter tour genuinely loves the experience,” Steve says, which may contribute – along with his passion for aviation – to why he refuses to retire. After flying special operations helicopters in the U.S. Air Force for 24 years, he says he’s still hooked on the thrill of helicopter flying. Orange Beach Helicopters and its parent company, Corporate Aircraft Solutions LLC, was established in 2011 by Steve and his brother Tom Olive to provide helicopter aerial survey and mapping. Since then, the company has branched out into aircraft maintenance and helicopter leasing from their office in Peachtree City, GA, as well as the helicopter sightseeing tour operation (Orange Beach Helicopters) in Orange Beach, AL. 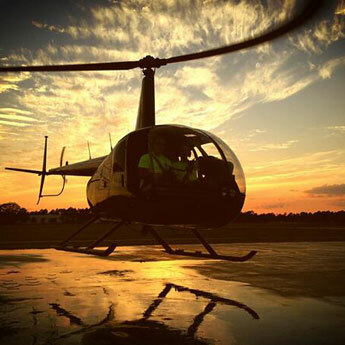 Orange Beach Helicopters is an FAA-certified Part 135 Charter and On-Demand operator, which simply means they are held to the highest standards of aircraft maintenance, pilot training and experience. The Orange Beach team consists of two experienced pilots and three ground support personnel. Helicopter tours are provided seven days per week, starting at 10 a.m. and ending at sunset. They are located at 28273 Perdido Beach Blvd. in Orange Beach. Open year-round, winter operations may vary, so be sure to give them a call to confirm in the off-season. You can call them at 855-496-2747 or book online. So whether you’ve lived in the area your entire life or this is your first visit, we’re sure you haven’t experienced the beauty on a grand scale like the one you’ll receive from this thrilling ride. There’s no better way to witness the Alabama Gulf Coast at its very best.